I've been working in or around Soho since I was 17, and Ten Ten Tei has been a regular over the years. It has always been my go-to place for cheap, decent sushi and while they don't serve certain things, like sea urchin, what they do is done well. The service, disinterested at best and surly at worst makes for a somewhat stifled atmosphere but it didn't matter much at a recent dinner with my parents there. 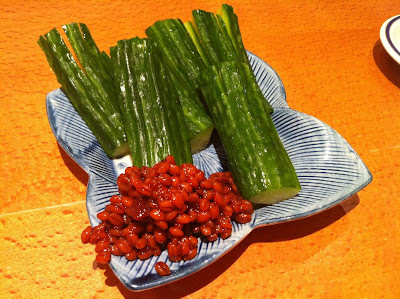 Cucumber with miso sauce was new to me; the cucumber crunchy and refreshing, the tiny little intensely sweet and savoury beans had the texture of pearl barley. 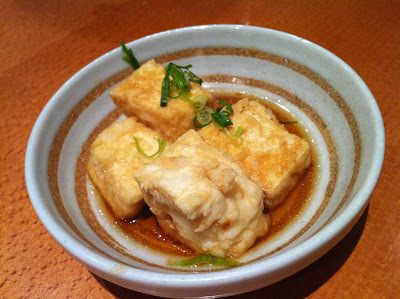 Agedashi tofu could have done with a thinner exterior but the portion generous and the crunch of the coating a pleasing contrast to its soft innards. Natto (there is a GREAT video that demonstrates the horrifying stickiness of the stuff on that link) was always a bit of a beast for me. I first tried it at Koya and was repulsed by its slimy smelliness but rolled into sushi it was actually quite nice. The nuttiness of the fermented soy beans came through nicely with just enough slime to keep you rolling it about in your mouth. Vinegared seaweed was another slimy one. 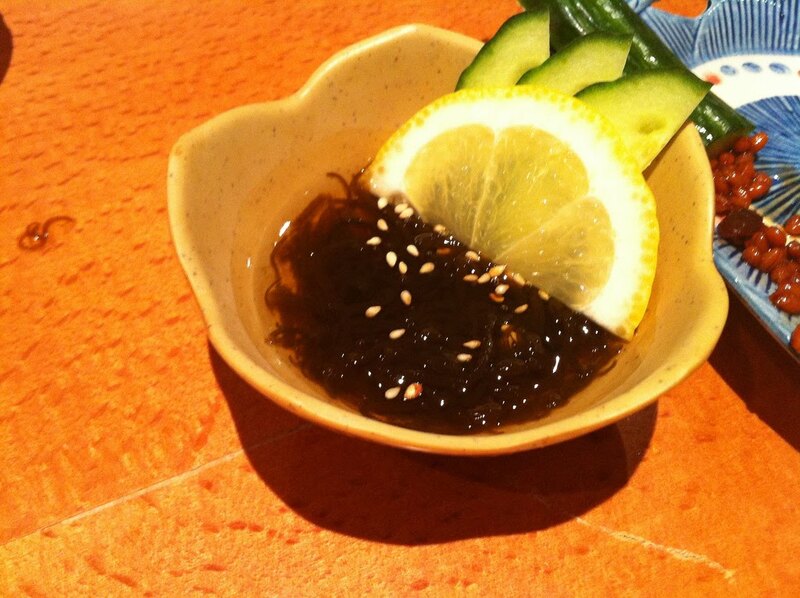 Intensely sour, the silken seaweed hung suspended in a jelly-like texture. Surprisingly addictive. Grilled salmon skin in vinegar sauce would have benefited from the salmon skin being crisper, but was otherwise pretty good with a scoop of the grated daikon underneath. Less was more with the vinegar dressing, as it had a faint whiff of soapiness. 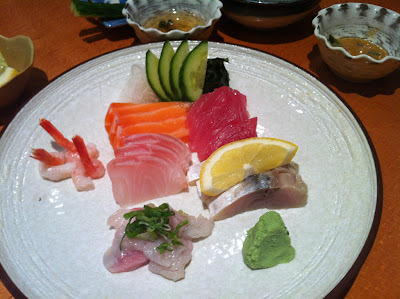 The sashimi plate was well presented, the fish all very fresh. Sweet shrimp were a particular favourite this evening. 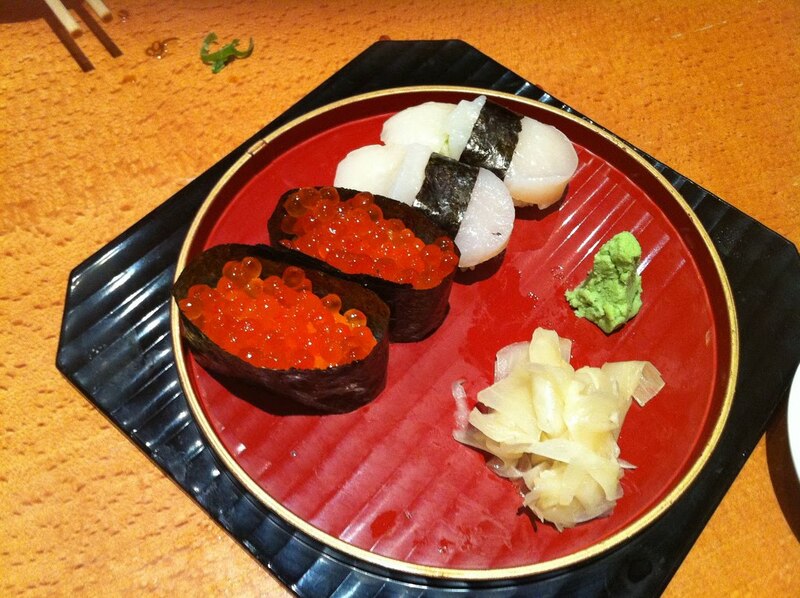 Scallop nigiri was a great example of its kind, sweet and silky. Ikura nigiri, while messy to eat gracefully was excellent. 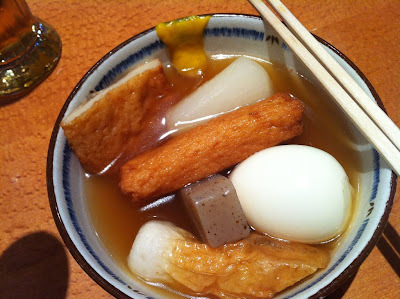 As if this wasn't enough, I finished off the dinner with the Oden stew, served only in wintertime. Fishcakes, egg and daikon are simmered in dashi. The broth is slightly sweet, slightly fishy with a deep umami flavour, the perfect bath for the springy fishcake. Though I'd have preferred a soft boiled egg, the tradition is hard boiled so I can't really complain about that. The grey rectangle you see in the middle of the picture is konnyaku; it doesn't taste of anything but is valued instead for its chewy texture. The bright smear of mustard on the side of the bowl livened things up somewhat. This dish was comforting and homely, one I've not tried before but one I'd definitely return for. As our dinner progressed the restaurant became busier and busier; downstairs is the place to be as the upstairs is a bit cold in atmosphere. With a couple of beers and an tempura udon each for Ma and Pa, the three of us ate handsomely for £30 a head. Ten Ten Tei was one of our favourite places for sushi in London - I loved the atmosphere sitting up at the bar drinking a beer and working through the menu. I think I first went, some years ago, on the back of your recommendations, Lizzie, on the BBC food chat board. I've enjoyed it a few times since then, and the prices are pretty darn good. I'm lucky that a great place has now opened up right near me up in the boonies of NW London, but I still pop in to TTT now and then. They threw me off kilter last time, service was actively friendly and helpful!!! Ooh, this sounds good. It's somewhere I've completely missed (being that before this post, i'd never heard of it) which sounds like a bit of a foodie omission on my part. 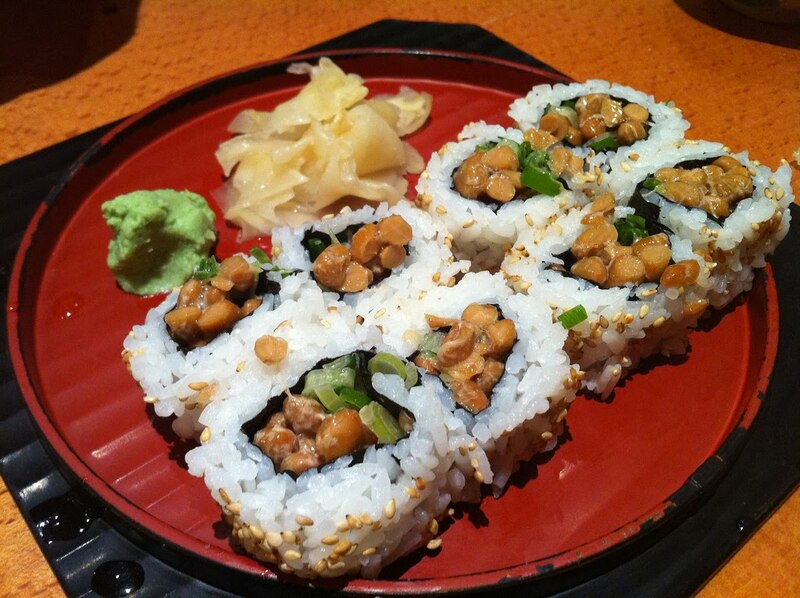 All except Natto which, along with whole avocado, is something I just can't eat. Not for want of trying either. Mind you, i've never tried it in a sushi roll. So maybe I'll give it another go. I would say that the nasu dengaku is decent but they do better at a place MiMi recommended to me, Hazuki, on Chandos Place. 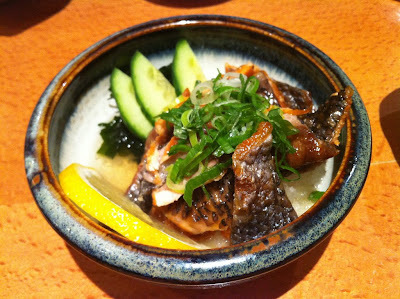 I love Ten Ten Tei, even with the irregular service – sometimes delighted to see you, sometimes practically pushing you out of the door once you've finished your last bite. Haven't been for ages - must go back.